Advocating for Limited Government, Free Markets, and Fiscal Responsibility. I am 53 years old and have been married for 32 years.. I am running for Governor because I have the answers to ten, of our most pronounced problems. The Illinois Providence Initiative consists of ten programs. These programs have names, and I will be able to explain each one in due time. I will explain why they will work, how they will work, and why they can’t fail. Two of the ten programs are economic plans. The base plan for Illinois is called NOVA. The Chicago specific plan is called Colossus. NOVA, once unleashed, will become a proverbial freight train. The good life finds everybody, and our State’s growth rate will quickly supersede our pending fiscal collapse. Our need for tradesman will test all labor feeds. Wages will become unparalleled within 8-11 months. My disabilities have me at a slight disadvantage. I need a lawyer to fill out the Governor’s election packet and signatures. The disabilities are temporary. I was hit buy a bus. Tired of this madness we need jobs not illegals to take the few that are available. I agree with John. It’s time for a third party that actually stands for something. The Republican party is essentially a lighter version of the Democrats. We need candidates who will do the right thing all the time, regardless of the consequences. I don’t see many Republicans with the courage to do just that. on your post is simply excellent and i could think you’re knowledgeable in this subject. feed to keep updated with drawing close post. It will take several years and much money to build a third party in Illinois, plus a continuing battle against the Tweedledee-Tweedledum parties running this state. A better use of time and money is to continue as we are: work “underground” to find, support and promote the best candidates we can find, whatever their previous party affiliations. recommended by persons who study natural treatment techniques. It has additionally been regarded as the number 1# 1 Colon Cleansing supplement by medical experts across the globe. novices. May you please prolong them a bit from subsequent time? know if thi alrigt with you. Thank you! 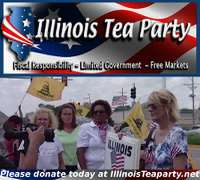 NOTE: The opinions expressed in items posted on this site do not necessarily represent the opinion of the Illinois Tea Party or any of the groups affiliated with Illinois Tea Party. Click HERE to see the US National Debt live.